During April and May, both Lab and Consumer department showed a healthy growth but observed a sharp decline in the month of June due to destocking by retailers over uncertainty over GST. In July, sales performance showed a decent increase.However, recovering lost sales for Consumer ware is not certain. There is reasonable certainty is for recoveey in Lab ware segment . GST is beneficial from long term perspective and it is already showing benefits in terms of interest from tax compliant organized players. The Company is focusing on threeprinciple growth drivers: LabQuest,Klasspack & Export. Q1 has seen good increase in the piece of products however profitability has been wiped out because of inefficiency of furnace, which is a short-term phenomenon. Scale benefits will start to kick in & Sales along with EBITDA margins are expected to increase faster over next two years. Shareholders’ approval awaited for a planned ESOP and also for a proposal to reduce face value of each share from INR 10 to INR 1. Board has also approved a scheme of amalgamation, however, statutory approvals are still awaited. Significant investment has been put into Larah and new warehouse in Jaipur. Traditional sale contributes to majority of business (60%). Modern trade constitutes 20 to 25% and rest is occupied by CSD and e-commerce. The lab ware division had a minor de-growth of 0.3% on standalone basis. Klasspack, the entity that was acquired by Borosil last year, registered a 14% YOY growth on standalone basis (Not on book as on last year). Overall lab ware division registered a 29.5% growth. The consumer ware division declined by 7% on standalone basis and Hopewell comprising the brand Larah, declined by about 11.5%. Overall Consumer division registered a 7% decline. The company revenue grew by 4% primarily fueled by revenue from Klasspack division. EBITDA declined to 8.4% of topline compared to 12.9% of toplinelast year. Lower EBITDA margin was due to decline in Hopewell (Larah) & rebuilding of furnace. PAT is down to 5 Crores this year from 10 Crores last yeardue to dismal Hopewell show and change in base year for calculation of capital gains tax. Gujrat Borosil achieved a sale of 43 Crore with an EBIDTA margin of 19.3%. Company has cash surplus of roughly 200 Crores which is put aside for future acquisitions. Company board has also approved the disposal of 68 Crores non-core assets. These non-core assets include some residential apartments in Mumbai and outside Mumbai. The current funds are being invested in mix of fixed income and liquid funds. Company has reduced its advertising expense in this quarter. Ad spend was about 3 Crores this quarter compared to 5 Crores in the same quarter last year. Equity has reduced substantially as a part of broader strategy to move from investment portfolio to traditional corporate treasury. There may be a fund raising activity for Gujrat Borosil in near future. Large CAPEX is meant for refurbishment of Hopewell furnace and the new warehouse. Company is doing fairly well in exports. In consumer segment, growth in microwave segment is supplemented by the newly introduced storage products. Borosil is also coming up with new advertising campaign on Lunchbox. This product has received fantastic reviews from the customers. Larah also won large contracts & its distribution penetration & customer acceptance are increasing. Company will start receiving input credits after implementation of GST. EBIDTA margin of Gujrat Borosil decreased because of a production trial of thinner glass material in newly implemented CAPEX facility. It is still not commercialized, but, the company expect to boost profitability for the same. Brosil’s primary business is in borosilicate glassware and there is no anti-dumping duty on that. Distribution of channels for consumer business: Traditional Trade: 60%, Modern Trade: 20-25%, CSD: 10-15% & E-Commerce: 5-6%. 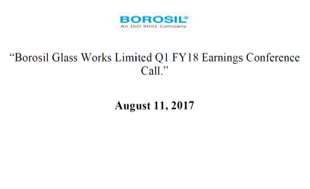 Borosil would earn margin by increasing quantum of sales and not trade. Certain tax credit can be availed after implementation of GST. By second half of 2017, Hopewell should have acapacity of 150 to 170 Crores. The company focuses its marketing spend on beon storage & Larah brand. The Company is a C class supplier in pharma industry. Product is of importance but of low value. Klasspack vials are entirely for pharma and 70% lab glass business is from pharma sector. Exports have been doing well for lab space. Company has been exporting to Middle East Africa and Southeast Asia in pharma space. The Ministry of Commerce has recommended applying anti-dumping duty to Chinese solar glass imports & only Ministry of Finance approval is pending. It is a good sign for the company. Another separate antidumping duty is applied on Chinese opal glass. Company is happy to compete in the level playing field created by the Government. Two separate antidumping duty which company applied for its two separate lines of businesshas gone to companies favour. This will boost company’s top-line in the short to medium run. There is antidumping duty applied to soda lime glassware also. However, Borosil is not really involved in that business. In UAE import duty has been reduced to 4.45% from 30-31%. However, most of the imports are from China & not from UAE, because of high cost structure. There are some undeclared Opalware import observed from Iran & Europe. Opal ware segment has market size of 500 Crores and it is growing rapidly at a rate of 15-20%. After implementation of GST, there could be substantial reduction in unbranded products from China. There will also be stocking of branded products. Pharma sector has been in distress for past 2 years and pricing in some pharma companies has been a challenge. Company had to offer some discounts to counter this challenge. 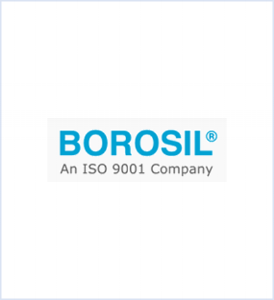 Borosil competes against La Opala, Cello & Treo in Opal-ware category.